Hi everyone! Quick post today, I am so tired from traveling back from NYC! I finally made it back home after 3 cancelled flights. My poor sister is still stuck there. My mom ended up changing her flight to stay back and keep her company. We had so much fun. I will be sharing my trip recap this week! I wanted to share a look that I wore while in NYC. I love the color of this wrap poncho. It’s super soft and warm and I love I can wear as a coat. This ruffle hem dress is super cute. I love the ruffle detail and it can worn as a dress or layered with leggings and boots. I paired with my faux leather leggings, that I literally wore almost every day in NY and suede OTK boots. 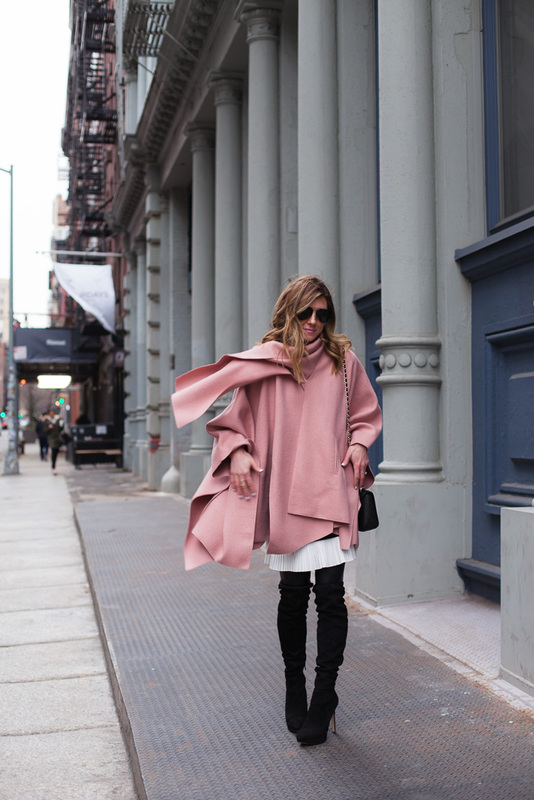 So in love with that cape! Perfect outfit!